Please have fun with this! So I started pulling out shiney fabrics, bits and pieces, and soon a collage appeared to use as a background. Cool. How to make them stick together fast and easy. Hmmm. Embellisher! So far I’ve used my embellisher for felting wool roving to stuff then wondered what would happen if I used it to “stick” one fabric to the other. It worked like a dream. Took some of the shine away, but that didn’t seem to matter. I should probably have used larger, therefore fewer, pieces, but what the heck. And since my current favourite quilting pattern is a spiral, that went on next over super fluffly batting. Now, what to put on top. Sure I could put a flower or leaf or - how about a word. How about the topic. How about use my new couching foot. Ergo, “spicey”! The couching foot is incredible. To think I used to lay the wool or whatever down and couch by hand. I was done before I could have threaded a needle! Spices - I read and thought oh oh. 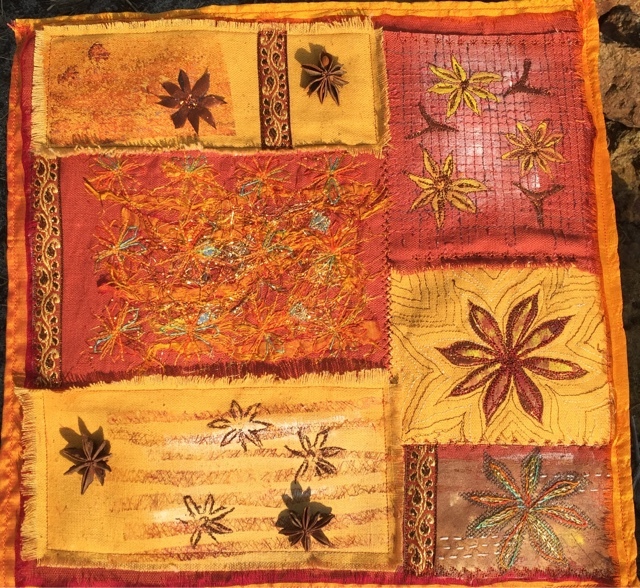 Im not a spice kinda girl but I do like the warm colours of them so pulled out two fabrics that I thought suited the theme both in colour and the fact the texture could be suitable for bagging up spices. I searched the library, the grocery aisles even took hubby to a museum exhibit ("The Spice Ships") for inspiration. But other than the rich golds and colours I drew a blank. A quilting weekend arrived. On my 3 hour drive to the destination I popped into a health food shop and found the Star Anise. I loved the shape and woody look of it. So bought half a dozen. 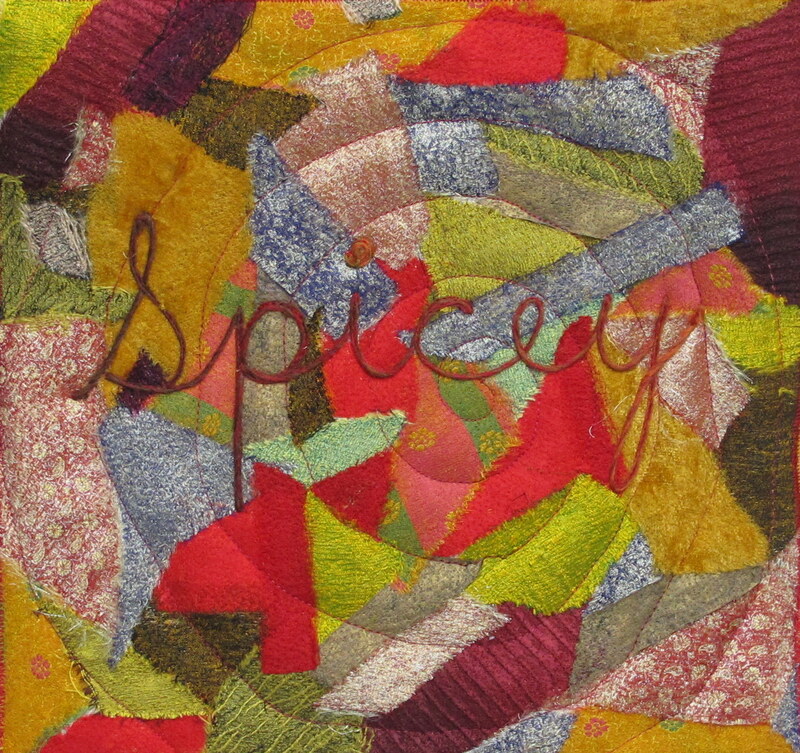 I then endeavored to find the perfect way to show my interpretation of this spice by working on several samples of different techniques. I enjoyed them all from painting the sticky side of Vliesofix, painting one and stamping with it then free motion stitching over the designs, lighting the fabric with paint, to hand embroidering over thread snippets which where machine stitched under "Romeo water soluble fabric". So instead of picking one I made my challenge quilt out of all of them. A month later I find myself in our holiday cottage with limited supplies and an unfinished project but luckily there was a local market where I bought a roll of re cycled sari fabric and some ribbon which finished a couple of blocks plus the borders of my piece. I felt it was complete once I added a few of the original stars. Thank you for a challenge that really made me get out my books and supplies and actually try some of them out. Happy New Year to you all and may it be one full of creativity. Ginger was on loan for the Christmas season, so is not finished. My sewing room gets turned into the "move this stuff out of the way in case my sister brings extra stuff" room at Christmas. My first spice thought was just to embellish a photo of the three shelves in my spice cupboard, but I decided against it as being far too labour-intensive! I altered an outline drawing of a gingerbread man and cut out two from gingerbread-coloured cotton and layered some Timtex between to give Ginger a gingerbready appearance. 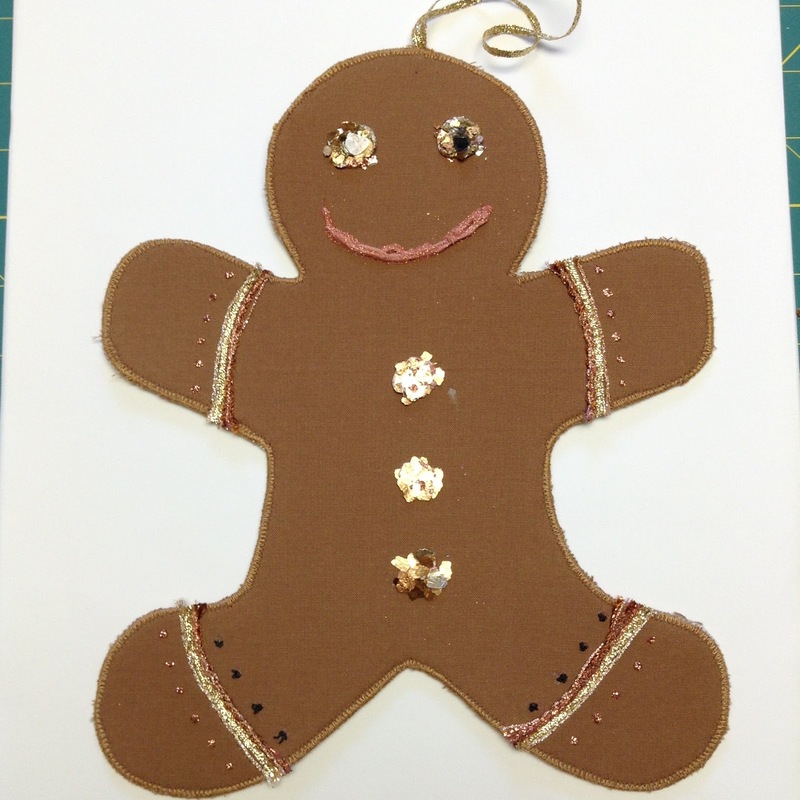 Ginger is trimmed in with some twisted cord I made, Kreinik braid, metallic threads, mica flakes, glitter, and puff paint - all in gingerbread-spice colours. Ginger will be going back in the oven for a bit!